Veterans Affairs Secretary Eric Shinseki has resigned amid widespread troubles in the VA healthcare system. President Barack Obama says he accepted the resignation with "considerable regret." He and Shinseki met in the Oval Office on Friday morning. Shinseki had faced mounting calls to step down from lawmakers in both parties. 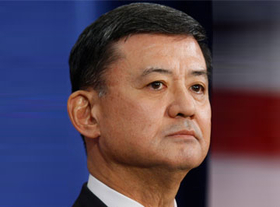 Shinseki's resignation comes two days after a scathing internal report found broad and deep-seated problems in the sprawling healthcare system. The system provides care to about 6.5 million veterans annually. Shinseki is a retired four-star Army general who has overseen the VA since the start of Obama's presidency. The controversy has ballooned into a top Washington issue since allegations surfaced that as many as 40 veterans may have died while awaiting care at the healthcare system in Phoenix, Arizona. But it is difficult to predict how significant the political fallout will be or how it could affect November's congressional elections. Although lawmakers from both parties have called for Shinseki's resignation, each side has moved cautiously, sensitive about being seen as exploiting the plight of veterans for political gain. So far, the political moves have been low-budget, mass telephone calls, web-based attacks and television commercials that will air relatively infrequently. They're likely to stay that way until it becomes clear how long-lasting the furor is. In a speech Friday, Shinseki said that the findings of the report were "totally unacceptable" and a "breach of trust" that he found irresponsible and indefensible. He announced a series of steps, including the ouster of senior officials at the troubled Phoenix healthcare facility, the initial focus on the investigation. He concurred with the report's conclusion that the problems extended throughout the 1,700 healthcare facilities nationwide, and said that "I was too trusting of some" in the VA system. "I can't explain the lack of integrity," he told a homeless veterans group Friday. "I will not defend it because it is not defensible." Obama has been under pressure to fire Shinseki from Republicans and politically vulnerable Democrats. "I'll have a serious conversation with him about whether he thinks he is prepared and has the capacity to take on the job of fixing it. I don't want any veteran to not be getting the kind of services they deserved," the president in an interview airing Friday on the television talk show "Live! With Kelly and Michael." A clip from the interview was aired Friday on ABC's Good Morning America. It is too early for a full accounting of any misbehavior at the department, which oversees pensions, education, healthcare and other benefits for veterans and their families. The aging network of hospitals and clinics — the VA opened its first new medical center in 17 years in 2012 — is one of the world's largest integrated healthcare systems. The VA system saw 5.5 million patients in 2008; that grew to 6.5 million in 2012-2013. The VA estimates the U.S. has more than 21 million veterans, men and women who fought in World War II through the war on terror. The largest group is Vietnam War veterans, who need more care as they age.